A paper wasp feeds on parsley flowers. Well, better late than never: here’s a wasp trying to get the jump on some parsley flowers that are just starting to open up. So I missed a couple days this week, because I hurt my back. (Where have I heard this story before?) Just a pulled muscle, but it has rendered me pretty useless. Other than rendering me a constant disappointment to my puppy, it has notably curtailed any bug photographing activity. Particularly disappointing with the phlox in full fragrance and at least one frequently visiting hummingbird clearwing moth to take shots of. Even more so considering August is flying by; between family events, volunteer activities, there was already going to be a premium on time for photography. Throw in some cool days and some rainy days, half the month was a wash from the get-go. I am feeling better however, so hopefully I progress and get some shots in tomorrow and over the weekend. 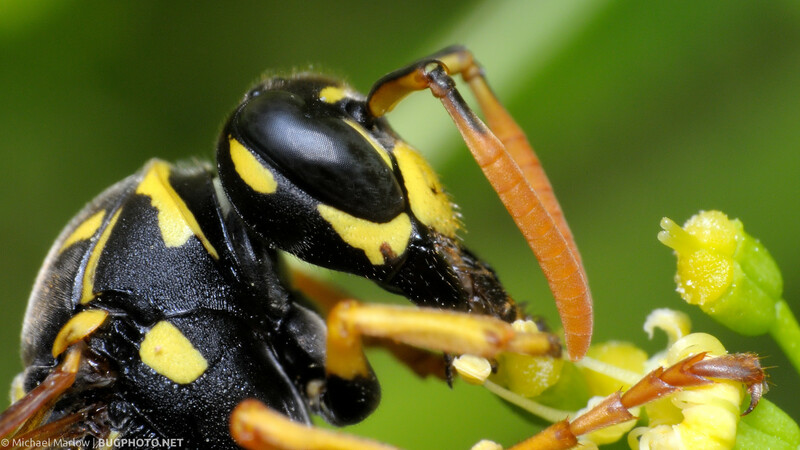 Posted in WaspsTagged antennae, Macro Photography, pain, paper wasp, parsley, Polistinae, yellow and blackBookmark the permalink. Thanks, Pat. That’s the thing with these pulled muscles, very painful, but not a lot a doctor can do about them. Feeling better today this morning, so I’ll probably try to get out and shoot a bit. The weather doesn’t look promising for insects however; we’re looking at cloudy and high sixties today here in western Massachusetts. Go figure.